If you have been looking out for places to hold a family get together, then Caramba Villa in Panchgani is an option you should check out. Why are we recommending it for a family vacay? Because this three-bedroom luxury villa can accommodate up to 15 people, has a private pool with a covered skylight – possibly the only one in Panchgani, and other amenities that will increasingly add to your plush stay here. About 250 km from Mumbai, Panchgani is a quiet little hilltop, also known as tableland as it’s a volcanic plateau. You can cab this four-hour journey, take your own car, or choose to take a bus, there is one every 20 minutes. Multiple trains ply on this route too. You can board one from CST and it will take you to Panchgani within four hours. A self-check-in villa, you need to just speak to the guards and get in any time after 2 PM. A large lounge area right in the beginning with landscaped verandah and a huge television set makes for a good spot to start your day chit-chatting while you chalk out your plan. 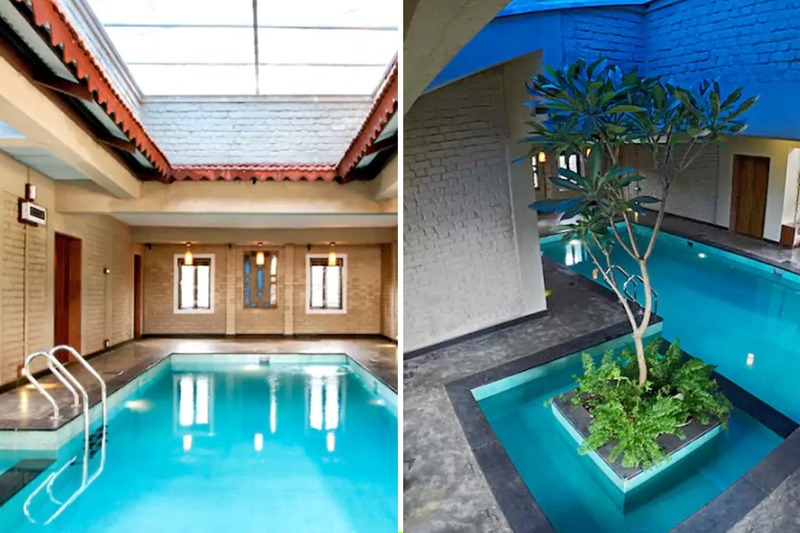 In the meantime, take a plunge in the private pool that is covered with a skylight. The villa also has a self-sufficient kitchen with basic condiments and appliances. But if cooking is not your idea of a vacation, all nearby restaurants parcel here and you can also get house help (on additional cost) to come and whip up some local delicacies. Remember you will have to manage your own water as there is no purifier on the property. But for all things kitchen, there is a local provision store nearby. The three air-conditioned bedrooms are spacious and are equipped with everything that will make your stay comfortable. They have also placed board games in the house to keep you engaged. Since Panchgani is also infamous for electricity woes, there is power backup too. The property is priced at INR 15,852 per night for up to six people, not something that will burn a hole in your pocket. But the rates may vary basis availability and season. Caramba Villa is much in demand and it’d be wise to book in advance. Get ready for an opulent weekend at Panchgani.